For almost 200 years inventors have been fascinated with the possibilities of the bicycle. But despite the technological progress, bikes are still the most common and efficient form of personal transport in the world. Communicating with nature and people by your bike – this is a true passion, which one can practice anywhere, at any time of the year and at low cost, a real health bonus for you and not the least – environmentally friendly! CYCLINGBULGARIA.COM will be delighted to help you do it! Enjoy Bulgarian mountains with Walking Bulgaria! 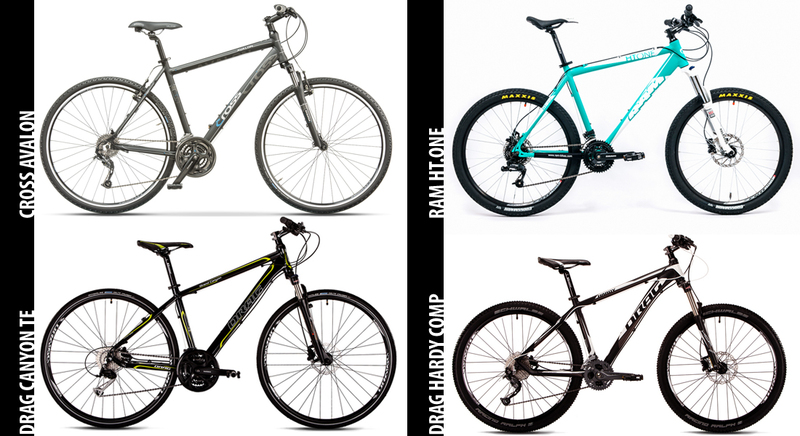 We have two type of bikes for trekking, Cross has a very strong frame with a lifetime warranty and very comfortable body position. All have locking damper fork and 29-inch tires. The next class Drag hybrid bike has a sports look with a very high class speeds and brakes. The models is worldwide famous Drag Canyon TE from 2014. Mountain bikes are also two classes. Drag Hardy MTB 2015 is for advanced bikes with its popular 27.5 tire size and hydraulic disc brakes with 180 mm disc. Second grade Ram HT1, known as a battle tank with its wheels with tires Maxis which are extremely robust.